Today I received all of my university keys and moved into my office. It's far from done, looks quite bland actually; however, the 12 boxes are out of our garage! Thank you sweet Shayne for putting up with me! Shayla was a HUGE help! Yesterday, she really impressed me. 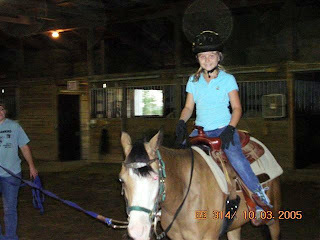 While getting ready for the 4H meeting, she took her prize winnings ($$) from Saturday's Horse Show and asked if we wanted to add anything to it and then she donated it to a fellow 4H family who recently lost their home due to fire. This kid is really amazing, but I'm positive Christi's journey taught her a lot!One must keep in mind that Shayla is a kid who does NOT like to part with HER money. (Dad's money is another story, cough.) Regardless, I was so proud of her. Shayla was a tremendous help on campus. The first thing I got out was my "Teacher Prayer" and a picture of my family. Then we started unloading it all. After we unloaded the boxes we went to lunch with four of my colleagues. I feel like I'm really going to like it there! I had a lovely surprise waiting for me in my mailbox, a plaque which reads "The most important things in life aren't things". Thanks, Jill!! After Ok, ok, I've got a long way to go, but it's out of my garage at least (smile)! Christi with sweet classmate and friend AliOne of Christi's good friends and one of my former students gave me a beautiful angel plaque at the end of the year. She wrote the sweetest message on the back and I told her I would put it in my BGSU office. I did that today. We went on a campus tour for potential students after lunch. The tour was going out anyway and I thought that would be a nice thing for us to do together so I set it up last week; we both really enjoyed it. (Shayla took my picture in front of the bell tower and College of Education.) Now back to this dissertation! A SHAYLA FUNNY: This week I received the name of my graduate assistant, a student getting her Masters degree in Reading who is to assist me for five hours each week. We were joking that I didn't really know how I would have her help me yet, but today Shayla came up with the idea that she could put my three shelves of books in "rainbow order" - the order that Christi organized her books in. I'd like to see the poor gal's face when I suggest that - hee hee! I told Shayla she'd say, "Out of all of the professors here, how did I get assigned to you?!" Aunt Marty sent me these two pictures last night. I don't believe I ever saw them before. 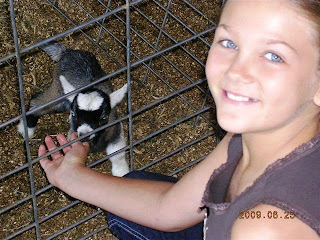 They were taken in the summer of 2005 when she babysat so I could attend my Ohio State classes. Both pictures totally cracked me up! The girls loved to play "Doggy Daycare" - something that we never knew existed until we spent 9 months living in the Ronald McDonald House in New York City. 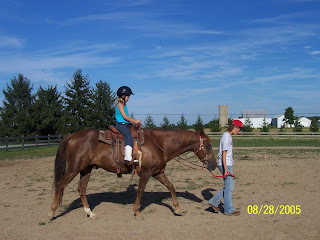 Christi on Kelsey's horse (August 05) About a year later, sweet Kelsey walked "The Riderless Horse" from the funeral home to the church, escorting Christi's body. We understand she cried the entire way. I walked by one of the older girls yesterday who was competing with her parents out of town. 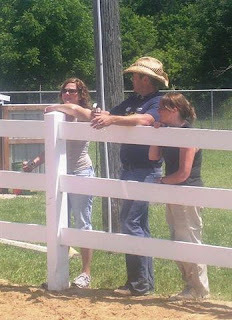 She was sitting up on her horse talking with her trainer debating if she should wear a helmet or her cowboy hat. I knew I was probably overstepping my boundries; however, I thought if something happened how could I live with myself for not saying anything so I stepped up, put a pretty firm grip on her thigh with my hand and said, "I've buried a daughter. Trust me, you don't want to make your parents go through that. Put on your helmet." and I walked away. I don't really even know this girl, but I did notice she wore a helmet the whole day and her trainer came up to me later and said, "Thank you for telling her that." I love this picture. Shayla is so blessed to have BOTH of her grandmas standing there and supporting her. From research I've read to have a well adjusted child, a child needs FOUR adults actively involved in their lives. No wonder Shayla seems to be so well adjusted, she has many more than that. God is good! Shayla and her favorite guy - Dad! Friday night, Shayne drove to Perrysburg after work as we learned Shayla needed a Western belt to finish off her outfit we got at the "horse garage sale" in the spring. 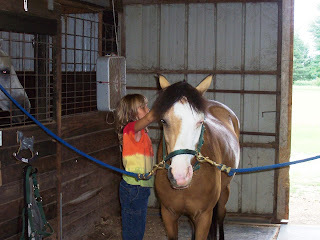 I took her to the barn to start getting Skeeter ready. She was amazing. 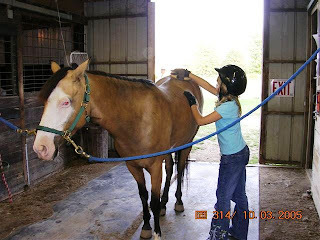 She bathed Skeeter entirely on her own, took the razer to trim his eyes, nose, ears and hoofs and started all of that banding of his mane too. I couldn't believe how amazing she was doing all of that. 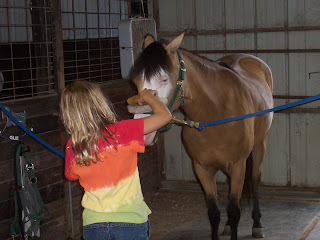 Shayla's really made some great friends doing this "horse stuff". 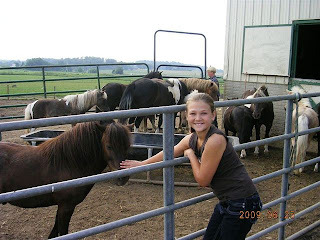 Shayla with her Stable Boy. Shayla really enjoys being at the barn with the older girls. It cracked me up the other night at the barn. The older girls all had their boyfriends helping them and Shayla had her dad helping her. It was great! No man could ever love her more! 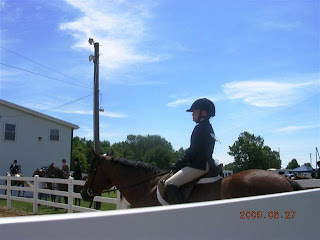 Shayla will be competing in two, possible three, horse shows this summer. Today was the first one. She had a ball. 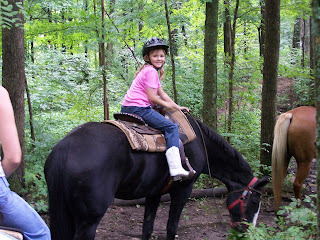 I was surprised what a difference one more year of weekly horse lessons did for her. She won a ribbon in eight of the nine contests she entered and was thrilled to win her first trophy too. I'm assuming she'll put it right beside Christi's. 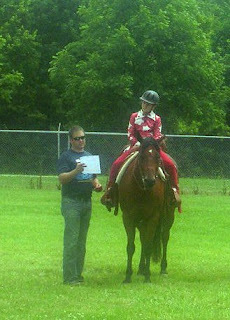 She didn't make Horse Princess or Runner Up for the fair, but she won FLY SPRAY! YES!! 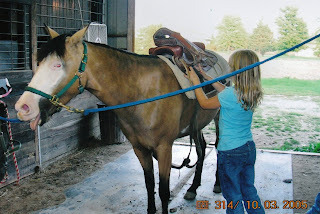 Much to my shock, at the end of the day I recognized Chessie and the sweet gal Christi took some of her first horse lessons with in the summer of 2005 - soon after we knew things were going to get ugly as her disease was beginning to take off again. I went and talked with the gal. 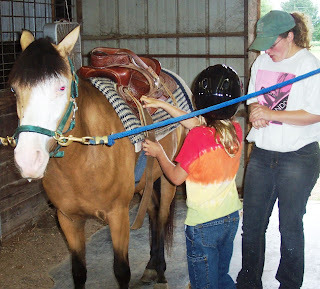 Her mom said, "Christi had a lot of fun on Chessie." I remember, how could you forget that sweet Chessie's face?! She's a beauty! Shayla went to basketball camp for a few hours each day this week. One day we took off after camp and drove about 3 hours (Well, Paw Paw drove - he's awesome.) 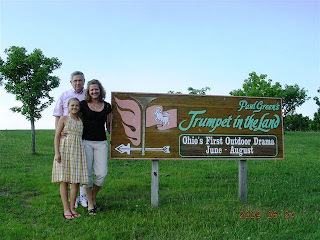 to New Philadelphia, OH to experience "Trumpet in the Land" (outdoor, historical, drama). We all four thoroughly enjoyed the "Behind the Scenes" tour and also the actual production. Shayla will be judged on her 4H project "Play the Role" (theatre) pretty soon. She'll also have her scrapbook judging on the same day. There are 20 4Hers competing in her age division. She's nearly finished her scrapbook with the "Drama" theme. Regardless of her grade or any possible ribbons, she learned a lot, enjoyed making it and we have a wonderful keepsake of her year! We stayed overnight in New Philly, Ohio and drove home through Amish Country, (Ahhhhh) to get Shayla back for basketball camp. This photo was given to me by Cassie after she received the 2009 CT Memorial Scholarship. 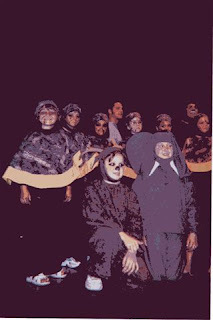 It was taken in 2006. 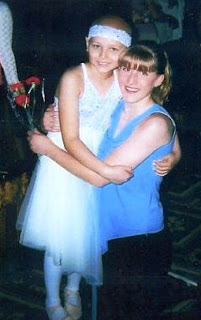 They "met" in 2005 when Christi told Cassie backstage she was scared. I spent that week in Columbus taking a class for my doc program. I understand Christi was not thrilled about her part - the little (and last one) of the snake. 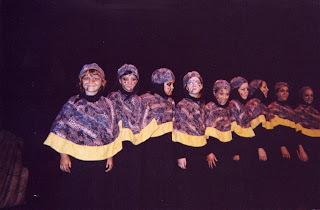 The next day when they gave her a maraca to "shake" she loved it and felt like she was the star of the play. They would pause and she would go "shake shake". What a hoot! I came back home from the class on Friday so I was able to watch both shows. God bless the Ritz Theatre and Misoula Children's Theatre.